Some of my ancestors were from the Louisiana swamps and some from the Ozarks. They were called Blue Gascons and French Staghounds. Selective breeding with foxhound varieties produced my breed as it is known today. Blue Tick does not refer to parasites which might ride on my body, but instead, it refers to my short, dense �ticked' coat. I am a really good coonhound, so if you like to hunt, I'd like to go along. Country living suits me much better than the city life. When fully grown, I am between 21 and 27 inches tall (53.3 to 68.6 centimeters) and I weigh between 45 and 80 pounds (20.3 to 36 kilograms). We have no Bluetick Coonhound Breeders listed at this time. 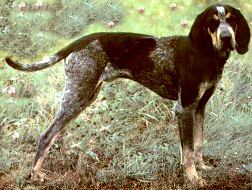 Click here to place your Bluetick Coonhound Ad!